On one level, the impeachment of Brazilian President Dilma Rousseff seems like vintage commedia dell'arte. But there’s nothing comedic about what the fall of Rousseff and her left-leaning Workers Party will mean for the 35 million Brazilians who’ve been lifted out of poverty over the past decade, or for the 40 million newly minted members of the middle class -- that’s one-fifth of Brazil's 200 million people. While it was the current downturn in the world's seventh largest economy that helped light the impeachment fuse, the crisis is rooted in the nature of Brazil's elites, its deeply flawed political institutions, and the not-so-dead hand of its 1964-1985 military dictatorship. Temer represents the center-right Brazilian Democratic Movement Party (PMDB), which until recently was in alliance with Rousseff's Workers Party. As soon as Rousseff was impeached by the Senate and suspended from office for 180 days, Temer made a sharp turn to the right on the economy, appointing a cabinet of ministers straight out of Brazils' dark years of dictatorship: all white, all male, and with the key portfolios in the hands of Brazil's historic elites. This comes in a country where just short of 51 percent of Brazilians describe themselves as black or mixed. Temer announced a program to “reform” labor laws and pensions, using code words for anti-union legislation and pension cuts. His new finance minister, Henrique Meirelles, a former central bank head who once led BankBoston in the United States, announced that while programs for the poor “which don't cost the budget that much” would be maintained -- like the highly popular and successful Bolsa Familia, which raised tens of millions out of poverty through small cash grants -- other Workers Party initiatives would go under the knife. For instance, one of the largest soybean farmers in Brazil, Blairo Maggi, was appointed agriculture minister. Maggi has overseen the destruction of vast areas of the Amazon to make way for soybean crops. Temer's initial appointment for science minister was an evangelical Protestant minister who doesn't believe in evolution. Temer also folded the culture ministry into the ministry of education, sparking sit-ins and demonstrations by artists, filmmakers, and musicians. Brazil has long been a country with sharp divisions between wealth and poverty, and its elites have a history of using violence and intimidation to get their way. Brazil's northeast is dominated by oligarchs who backed the 1964 military coup and manipulated the post-dictatorship constitution. Brazil's legislature is splintered into 35 different parties, many of them without any particular political philosophy. The legislature is elected on the basis of proportional representation, but with an added twist: There’s an “open list” system in which voters can choose any candidate, many of them standing on the same ticket. The key to winning elections in Brazil, then, is name recognition, and the key to that is lots and lots of money. Most of that money comes from Brazil's elites, like the oligarchs in the country's northeast. Because of the plethora of parties, forming a government is tricky. What normally happens is that one of the larger parties ropes in several smaller parties by giving them ministries. Not only does this encourage corruption -- each party knows it needs to raise lots of money for elections -- but also results in political incoherence. When the Workers Party was elected in 2002, it was unwilling to dilute its programs by bringing ideological opponents into a cabinet -- yet the party still needed partners. The solution was cash payouts to legislators, a scheme titled mensalao (“monthly payoffs”) that was uncovered in 2005. Once the payoffs were revealed, the party had little choice but to fall back on the old system of handing out ministries in exchange for votes. That’s how Temer and the PMBD entered the scene. With the reputation of the popular former president Lula da Silva and his Workers Party dented by the payoff scheme, the right saw an opportunity to rid themselves of the left. But Silva's resilient popularity and the success of his anti-poverty programs made the party pretty much unassailable at the ballot box. Silva won another landslide election in 2006, and his successor Rousseff was elected twice in 2010 and 2014. Rousseff's biggest mistake was to run on an anti-austerity platform in 2014 and then reverse course after she was elected, putting the brakes on spending. The economy was already troubled and austerity made it worse. The 2005 bribery scheme lost the Workers Party some of the middle class, and the 2014 austerity alienated some of the party's working class supporters. 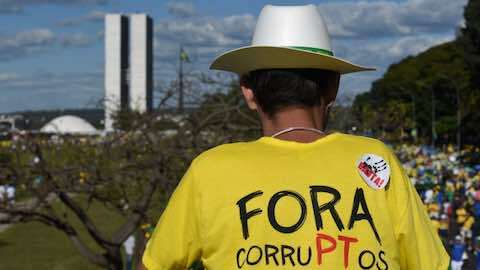 But it was most likely Rousseff's decision to green light the Petrobras corruption investigation that spurred her enemies to strike before the probe could pull down scores of political leaders and wealthy construction owners. Temer’s own anti-corruption minister was recently caught on tape plotting to use the impeachment to derail the investigation, an event that led to his resignation. Certainly the campaign aimed at Rousseff was well orchestrated. Brazil's media -- dominated by a few elite families -- led the charge. According to Reporters Without Borders, the role of the media was “partisan,” its anti-Rousseff agenda “barely veiled.” Judge Sergio Moro, a key figure in the Petrobras investigation, illegally leaked wiretap intercepts that put Silva and Rousseff in a bad light. Brazil's economy is in trouble, shrinking 3.7 percent last year. Commodity prices are down worldwide, in large part because of the downturn of China's economy. Brazil’s debt is rising, though it’s still half that of Italy. And unemployment is low, at least compared to the indebted countries of Europe. A return to the austerity policies that destroyed economies all across the southern cone during the 1980s and '90s -- and which are decimating parts of Europe today -- would be a disaster. The worst thing one can do in a recession is curb spending, which stalls out economies and puts countries into a debt spiral. One of Temer's first acts was to put up 100,000 billboards all over the country with the slogan: “Don't speak of crisis; work!” That sounds a lot like “shut up.” Yet Brazilians aren’t noted for being quiet, particularly if the government instituting painful cuts is unelected. Latin America: "A Very Brazilian Coup"